Tuesday, 20 September 2016, 5:00-6:30 p.m. It is hard to overestimate the role people in the early EOS team like Yoram Kaufman played in shaping aerosol science today. With its flexibility, global coverage and ease of data access the MODIS sensor in particular has historically dominated the aerosol monitoring field. Since Yoram’s untimely passing a decade ago, aerosol remote sensing has advanced at an exponential rate. The field has grown in size, sensors are cheaper and easier to build and fly, and of course Moore’s Law marches on. Individual sensors feed multiple product lines, and synergistic use of active and passive measurements is increasingly common. Whereas 15 years ago the creation of a viable satellite aerosol product was heralded as a landmark achievement, today new retrievals are being generated regularly, and include a number of products in addition to simple Aerosol Optical Thickness. However, manipulation and evaluation of these products takes considerable effort, not to mention software engineering prowess. Verification is largely automated, and the scientific usefulness of the data is obscured by the sheer data volume. In short, we are buried in data and we don’t have the time and money to look at even a fraction of it objectively and in detail. As for real science progress, we have entered the steep part of the power curve where an increase in scientific understanding now requires a great deal more effort-much due to simple data manipulation and storage. Algorithm development and data processing are now every bit as much fundamental science as aerosol lifecycle and climate forcing. 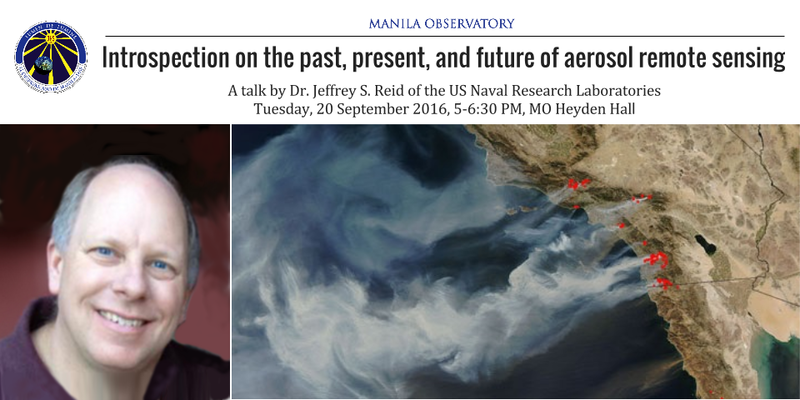 This talk is in part personal history lesson and in part introspection and musings on the future of the coevolution of aerosol remote sensing and modeling. These thoughts are underpinned by the field’s recurring challenges of calibration, realistic radiative transfer, data assimilation, data management, and fundamental observability of the system. NASA/MODIS Rapid Response: An image of wildfires in Southern California taken by one of NASA’s MODIS satellites on the afternoon of October 22, 2007. The red dots are hot spots (fire pixels). Public Domain.